Pasta beef and cheese, please! The days are dark earlier and the nights are cooling down. It’s time for some serious cold weather food. Good-bye BBQ! This casserole is delicious and it doesn’t make so much that you look at it and wonder how long it will take to finish off the pan. 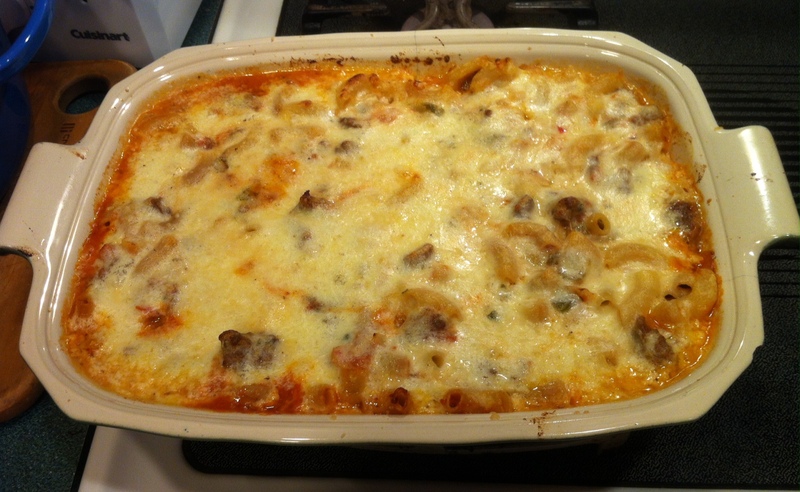 Often casseroles make massive amounts that often go wasted because you get bored with eating it over and over again. This fed the two of us two dinners, one lunch and one work dinner. Just enough before I get bored. This makes 4 generous servings for a family! Don’t be put off by the number of steps. None of them are difficult. As always, get all your ingredients chopped and in bowls, spices out on the counter and cans opened. This makes the cooking process less chaotic. You probably have most of the ingredients for this recipe already. Here’s what we are going to do. First we cook the elbow macaroni. Then we cook the vegetables and meat, then, we make the cheese sauce. This is what the French call béchamel sauce with cheese. Fancy schmany, oui? No! Very simple. Then we combine everything a bake it ‘til it bubbles! Step 1: Bring the water with salt to a boil. Add the macaroni; stir and simmer until tender, about 5 minutes. Do not overcook. Drain and rinse under cold water to stop the cooking. Put this aside. Step 2: In a skillet, heat the oil and then add the onions, celery, green peppers and garlic. Cook, stirring until wilted. Add the meat, salt and pepper. Cook, stirring until the meat loses its red color. Add the oregano, parsley and crushed tomatoes. Cook, stirring for 5 minutes. Add the cooked macaroni. Blend well and set aside. Step 3: Preheat oven to 350 degrees. Step 4: Melt the butter in a saucepan, and stir in the flour with a wire whisk until well blended. I love to use this flat whisk to get along the insides of the pans. Add the milk, stirring rapidly and bring to simmer. Cook, stirring, for about 5 minutes. Step 5: Remove sauce from the heat, and stir in the cheddar cheese, cayenne, nutmeg, and more salt and pepper to taste. Taste the sauce before you add any salt since the cheese is salty. Stir until the cheese melts. I bought a 10-ounce bar of cheese and cubed it. I added a little more since the cubes take more space in the measuring cup. More cheese is better than less! Step 7: Spoon the macaroni mixture into a baking dish measuring about 7 by 10 by 2 ½ inches. If you don’t have a pan exactly this size, don’t worry. You could put it in 2 pie plates, or another pan. Just remember to leave room for the sauce. Pour the cheese sauce evenly over the macaroni mixture. Sprinkle with Parmesan cheese. Put in oven for about 15 minutes. You want the sauce to be bubbling and starting to lightly brown. Here’s the original recipe from NYT Cooking.